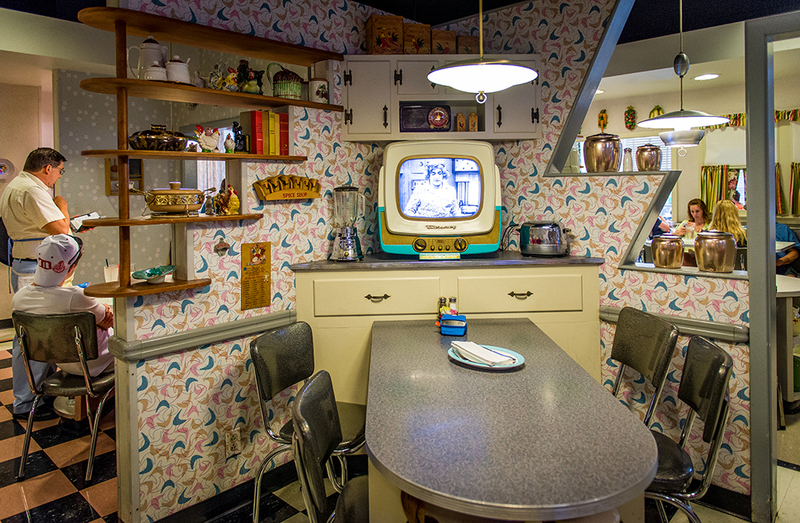 If you’re looking for the comfort of Mom’s kitchen while you’re visiting Hollywood Studios, make sure to stop in to 50’s Prime Time Cafe. This restaurant takes you back to Mom’s kitchen in the 50’s and is full of classic American comfort foods. 50’s Prime Time Cafe is often over-looked since it is hiding behind Hollywood and Vine, a popular character meal, along Echo Lake in Hollywood Studios. We stopped into 50’s Prime Time Cafe during our trip in May 2014 and we were not disappointed. 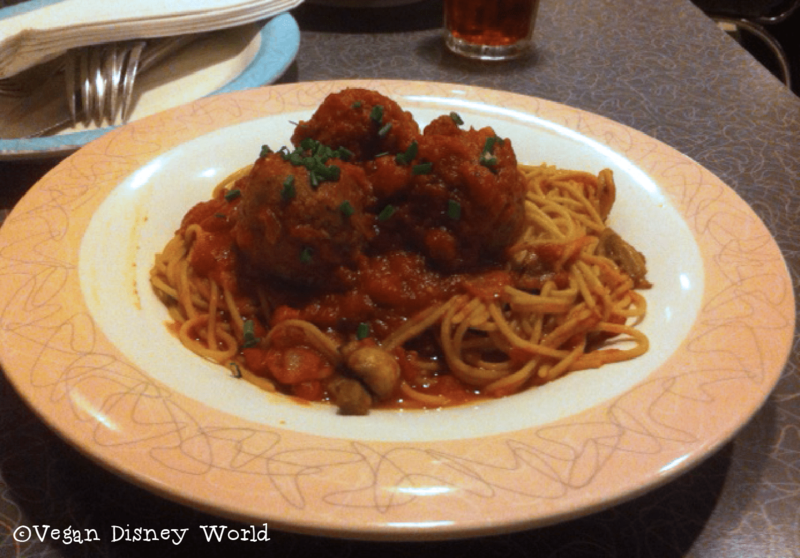 We were happy to see that there is a potentially vegan item already on the menu, Sissy’s Vegetarian Favorite Multigrain Spaghetti, which included vegetarian meatballs! When our server came out we informed him of our vegan diet and he said he would talk to a chef for us. Usually I prefer to speak to a chef directly, however this server was very quick and had great communication between us and the chef that we didn’t even need to speak to him. He returned and told us that the vegetarian item is vegan as is and that they also have vegan ice cream. Seeing that they had a list of milkshakes on the menu, I asked about getting a vegan milkshake. Our server left and returned almost immediately to tell me that I could get a vegan milkshake. I had the option of a vanilla or chocolate shake, I obviously went with chocolate. 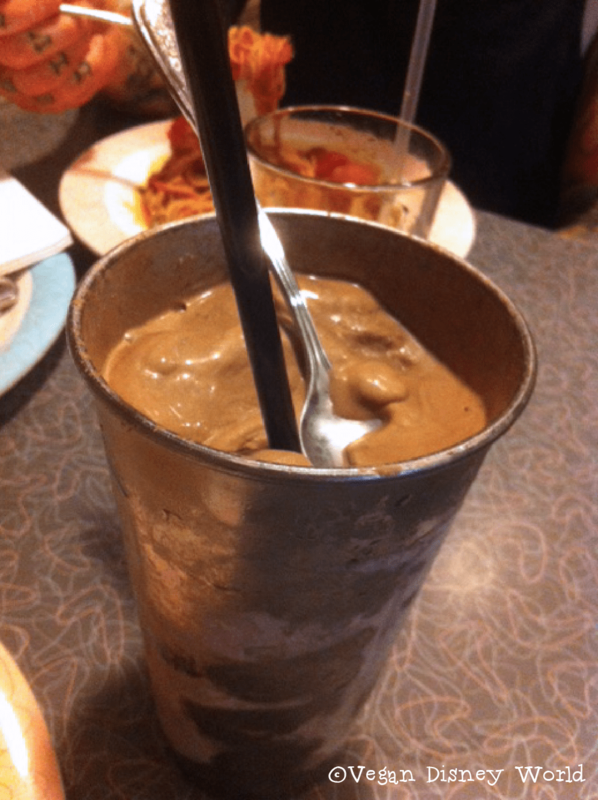 The consistency was very thick like a frosty, so we couldn’t really drink it until it melted. Also, it was huge. I was glad that Corey didn’t order one so we could share my giant shake. 50’s Prime Time Cafe is apparently known for their milkshakes, so it makes sense that they are huge. The chef used Tofutti for my milkshake, but Rice Dream was also an option. I would definitely come back for a shake. There is only one other place on property I have found vegan milkshakes which is Sci-Fi Dine-In Theatre, also in Hollywood Studios. On top of our giant chocolate milkshake, we also got a huge plate of spaghetti. Sissy’s Vegetarian Favorite Multigrain Spaghetti is completely vegan as is. It comes with a mushroom sauce and vegetarian meatballs. The sauce was a little bland and the mushrooms weren’t great. Adding a little salt and avoiding the mushrooms made this dish much better. The meatballs had a great texture but unfortunately weren’t very flavorful. We were really happy to see this option on the menu because even vegans deserve some comfort food. Since Disney World is slowly becoming more and more vegan friendly, I’m hoping that one of my future visits I will be able to put vegan parmesan on my spaghetti, we can only hope though. 50’s Prime Time Cafe was a place we decided to go on a whim and I am so glad we went. I had been once as a kid but never as a vegan. I loved the theme and the servers stayed in character for most of your meal. I have heard that if you don’t adhere to Mom’s rules, like keeping your elbows off the table, they have hilarious punishments for you. Maybe next time I’ll test this out. Yes! The service was great, our server had great communication between us and the chef. Being able to get a vegan milkshake is also a huge bonus. The spaghetti dish was good but not great. I would suggest this restaurant to either vegans traveling with meat eaters, they have lots of meat heavy dishes, or just vegans who are looking for some comfort food. Thanks Amanda! We went in May and just haven’t shared our review that will say all of that. We were so bummed. When I went here last year, I asked the bartender at the Prime Time Lounge for a vegan milkshake. He looked at me strangely and told me they don’t make the milkshakes vegan. I said, “Oh that’s strange. I heard you make non-dairy milkshakes,” thinking that maybe he didn’t recognize the word “vegan” but he would “non-dairy.” He checked with the kitchen at the Prime Time Cafe and came back and told me that they don’t make non-dairy milkshakes. When I read this post and saw people posting about the vegan milkshakes on the Veg Disney group page on Facebook, I asked if anyone else had my experience. Apparently, some staff will tell you they don’t make them, but others do. So frustrating. 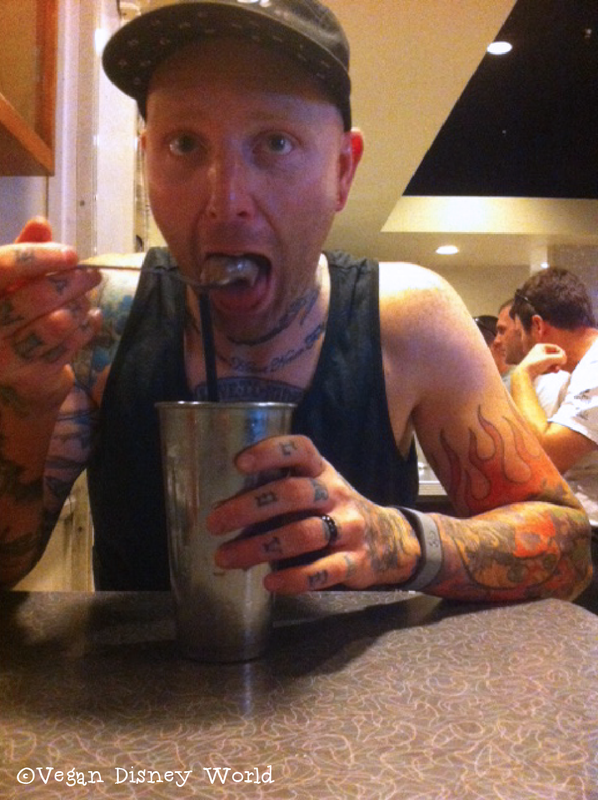 I want that vegan milkshake! Came to eat here on 5/27, egg is in the spaghetti they use. Yeah we are there early this month and was told the new vegetarian balls have egg in them. Such a bummer.